I have found the best coverage of this topic in Jake VanderPlas’ excellent Python Data Science Handbook. I plan to write a review on this book in the future but the short and sweet is that it is a great resource that I highly recommend. While aggregation must return a reduced version of the data, transformation can return some transformed version of the full data to recombine. For such a transformation, the output is the same shape as the input. A common example is to center the data by subtracting the group-wise mean. With that basic definition, I will go through another example that can explain how this is useful in other instances outside of centering data. You can see in the data that the file contains 3 different orders (10001, 10005 and 10006) and that each order consists has multiple products (aka skus). The tricky part in this calculation is that we need to get a total for each order and combine it back with the transaction level detail in order to get the percentages. In Excel, you could try to use some version of a subtotal to try to calculate the values. If you are familiar with pandas, your first inclination is going to be trying to group the data into a new dataframe and combine it in a multi-step process. Here’s what that approach would look like. 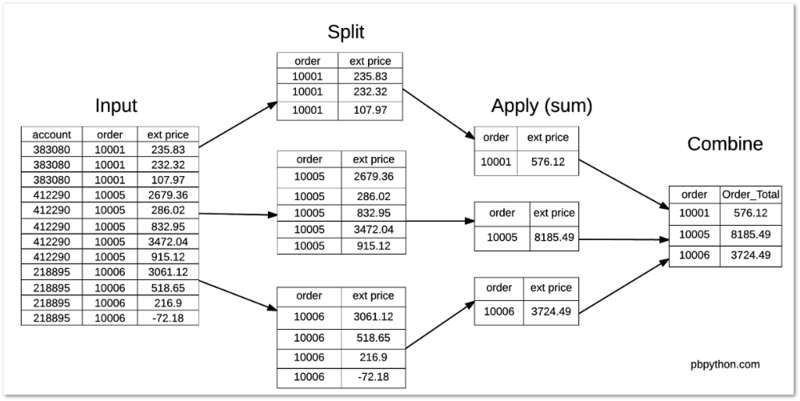 Now that the data is in a dataframe, determining the total by order is simple with the help of the standard groupby aggregation. This certainly works but there are several steps needed to get the data combined in the manner we need. You will notice how this returns a different size data set from our normal groupby functions. Instead of only showing the totals for 3 orders, we retain the same number of items as the original data set. That is the unique feature of using transform . After taking the time to understand transform , I think you will agree that this tool can be very powerful - even if it is a unique approach as compared to the standard Excel mindset. I am continually amazed at the power of pandas to make complex numerical manipulations very efficient. Despite working with pandas for a while, I never took the time to figure out how to use transform. Now that I understand how it works, I am sure I will be able to use it in future analysis and hope that you will find this useful as well.